More than equipped to push your trail-riding to the very limits, the Escarpe is Vitus' tried and trusted all-around trail bike. Full of tech and spec to ensure an exhilarating and exciting run on every ride, it is built for big thrills. Built with superbly low, slack and long geometry, the Escarpe Mountain Bike lets you ride with fun, excitement and poise with its full suspension setup allowing you to go for it as aggressively as you wish. Soaking up every morsel of impact is a RockShox fork and shock combo with 150mm of front travel, while the SRAM NX 1x11 drivetrain powers you on and the Shimano MT-400 disc brakes rein you back in. Rolling on a "Boost"-sized, tubeless ready wheelset and wide Maxxis 3C tyres, no terrain is off limits to this marvellous mountain bike. 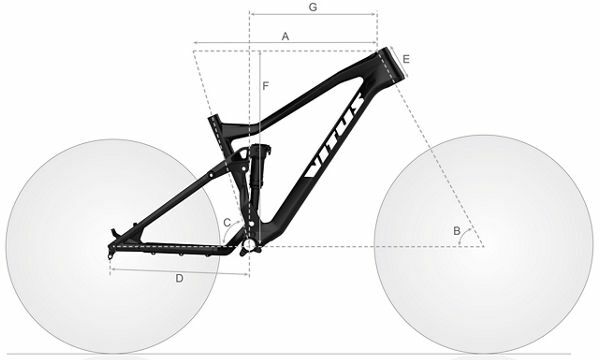 Another superb offering from Vitus, this is a genuine full suspension superstar. I land bang on the border for small/medium size in this bike. 170cm tall, 30&quot; inside leg. Do I size up or down? Hi, what is the weight of this bike in size medium? Thanks. This will be approximately 33lbs when set up tubeless. What colour is the word Vitus on the down tube? The Vitus logo is in black on this frame. Does this bike comes with pedals? I'm 5'8 what size should I buy? I can confirm that basic pedals will be supplied. For advice on sizing we'd recommend using the Live Chat facility on our website as there's a few more questions we'll need to ask.